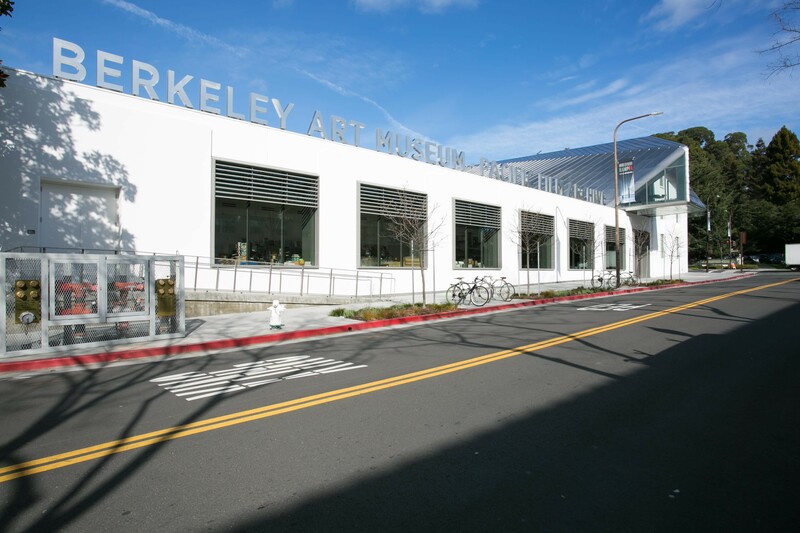 The Berkeley Art Museum and Pacific Film Archive reopens with two new theaters and a set of sprawling galleries. BAMPFA's grand reopening at 2155 Center St., Berkeley, will be a free community day on January 31, 11 a.m.–11 p.m. RSVP at BAMPFA.org/tickets. Most people recognize the Berkeley Art Museum and Pacific Film Archive building as the old monolithic beast on Bancroft Way and College Avenue. The imposing, concrete hull is a quintessential piece of brutalist architecture. Inside, heavy cantilevers jut into the building's central atrium, connected with ramps to create a spiral incline of gallery spaces. From any given vantage point, the collage of concrete slabs evoked a desaturated painting by Hans Hoffman — the influential Abstract Expressionist who planted the seed for BAMPFA in 1963 when he donated 45 paintings and $250,000 to UC Berkeley for a new art gallery. The Ciampi building, as museum staff used to call it, in reference to its architect Mario Ciampi, housed BAMPFA from 1964 through 2014, during which time it presented solo exhibitions for such seminal artists as Chuck Close, Robert Mapplethorpe, Jay DeFeo, and Bruce Nauman. But for more than a decade, museum administrators knew the Ciampi building was seismically unsound, and it was eventually shuttered at the end of 2014. 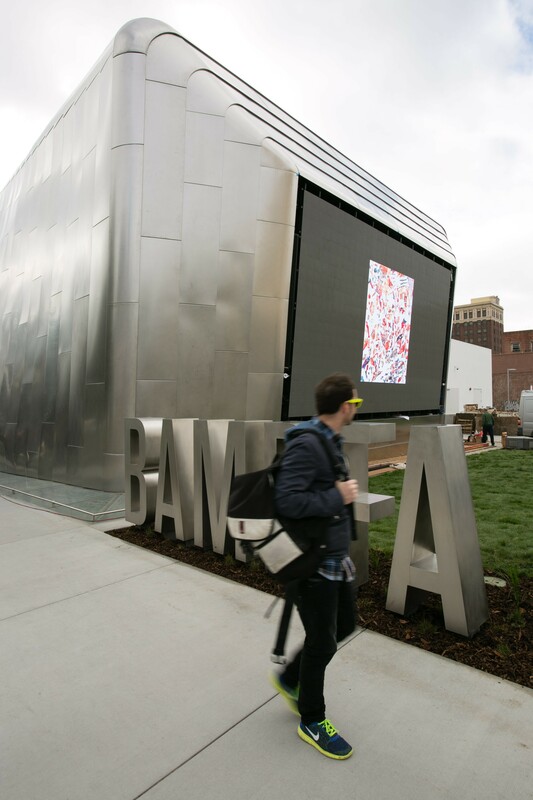 After a year-long transition, BAMPFA will reopen its doors on January 31 in its sleek new facility at 2155 Center Street (at Oxford Street). The museum's outdoor LED movie screen. BAMPFA's new site, an 82,670 square-foot building by esteemed New York City design partners Diller Scofido + Renfro, looks partially like a biomorphic space shuttle. While the south end, which is a renovated printing plant that was built in 1939, appears traditionally rectangular, the expansion on the north end slopes off the original structure like a graceful, metallic exoskeleton. The slope culminates in a futuristic face — a thirty-foot-wide LED screen facing outward. Equipped with a Meyer Sound system of directional speakers, the screen will work to both draw in the public with artistic teasers and entertain them outside with open air cinema, rendering the boundaries of the museum newly porous. Architects don't often attain celebrity status, but Diller Scofido + Renfro comes pretty close. The firm's past projects include the first mile of New York City's High Line and the new Broad museum in Los Angeles. Later this year, the firm will unveil its expansion of the Museum of Modern Art, also in New York City. BAMPFA's new building holds up to the reputation. The interior contrasts Ciampi's elemental simplicity with a dynamic orchestra of angular spaces created by dramatic meetings of brick red and white — the only two colors used in the building, besides its metallic accents. Although the new site is technically smaller in square footage than the previous one, it feels far more expansive. (That's partially due to the museum moving most of its storage offsite.) The galleries maintain the factory feel of the printing plant, with concrete floors and high, vaulted ceilings. They're made up of straightforward white walls that can be reconfigured for different exhibitions, which BAMPFA director Larry Rinder said will allow curators much more freedom with installation than they previously enjoyed in the Ciampi building. With all temporary walls out of the way, the biggest gallery can be as large as 10,000 square feet. 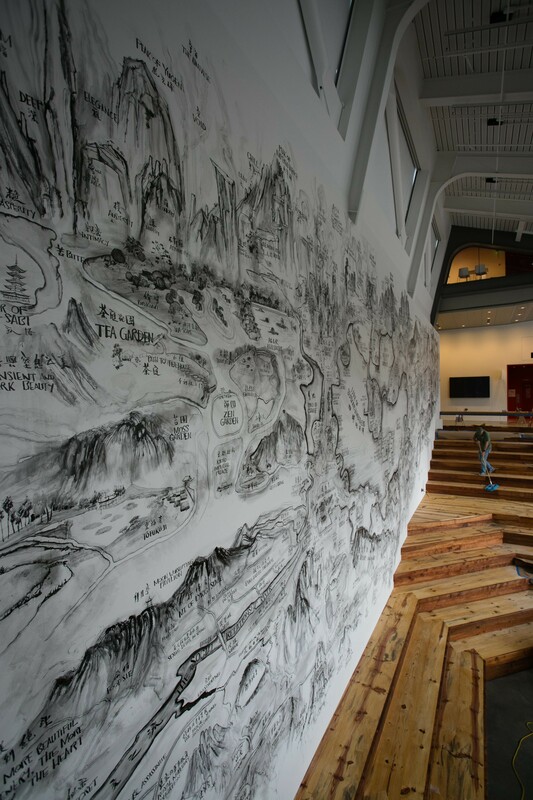 The new building's entrance opens to a massive wall where the museum will host an ongoing series of commissioned mural projects — the first is by renowned Chinese artist Qiu Zhijie. Below it, an amphitheater designed by celebrated local wood joinery craftsman Paul Discoe and made from pine trees cut down during the site's construction welcomes visitors with performances and lounging opportunities. The museum's film library, which was once an obscured closet-like space, is now a spacious study center with more than 300,000 film-related documents and ephemera. The facility also has an experimental fiction and poetry reading room, and study centers for scholars in three other fields: works on paper, Asian art, and conceptual art. An all-ages art lab has been added as well, for regular hands-on art workshops. And a digital engagement touchscreen will allow visitors to easily peruse the museum's entire collection. Babette, the museum's beloved cafe, inhabits the peak of the building, in a futuristic cove lit by a towering, triangular window. A site-specific mural by Qiu Zhijie above the amphitheater designed by Paul Discoe. 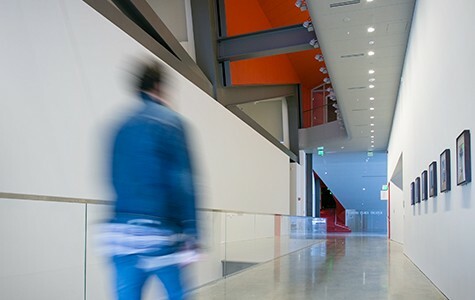 But the building's best new element is the 232-seat Barbro Osher Theater, which will feature the majority of BAMPFA's treasured film programming, replacing the converted UC Berkeley lecture hall that the museum once used. It boasts top-of-the-line technology, including a Meyer Sound System and the ability to screen in virtually any film format, as well as a stage for live musical accompaniment. There is also a smaller theater, just 33 seats, for research and special viewings. As one of the country's foremost film archives, BAMPFA will finally be able to showcase its collection with the facilities it deserves — and in a space not annexed from the art. It's clear from the bright marquee above the entrance that the institution is ready to bring film to the forefront of its programming. Plus, museum visitors may as well stay for a film, because tickets to the theater provide access to the galleries, but not the other way around. The first film series in the new theater will be Cinema Mon Amour, which will highlight classics from throughout film history presented by both local and international filmmakers, scholars, and critics. The series will inaugurate the theater on February 3 with Ingmar Bergman's The Seventh Seal, chosen and presented by Barbro Osher herself. This year will also feature retrospective series for directors Nuri Bilge Ceylan, Jean Epstein, Lucrecia Martel, Nicholas Ray, and many others. In the galleries, the first show will be the Architecture of Life, a survey of architectural works that reflects on structure as a metaphor for life experience and the ability for design to shape the social reality of the world we live in. The exhibition features work that spans a timeline of two millennia and originates from all over the world. And it's explicitly a celebration of the museum's new architectural artifact, prompting visitors to take in the new building not only as a facility, but also as the largest addition to the museum's collection — itself a piece of art.